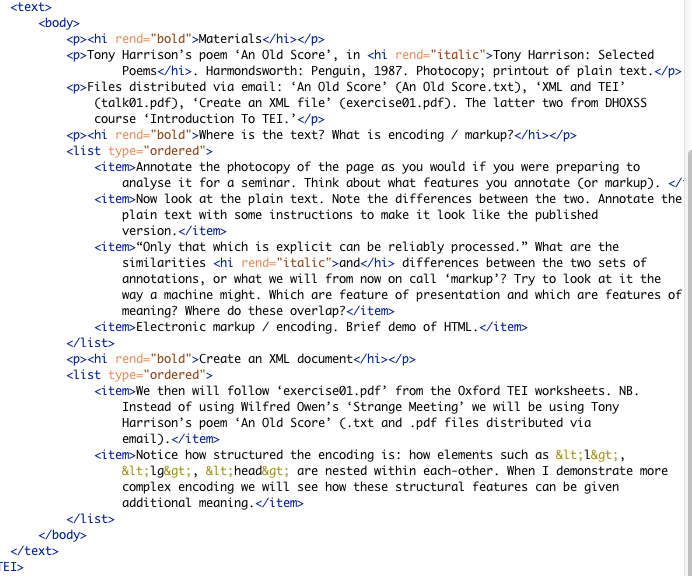 This is an overview and reflection on a two-hour workshop I ran for English Literature undergraduates introducing XML/TEI. ‘Encoding worksheet’ (word doc) is here. Previously I had taught XML/TEI in one-to-one tutorials, so this was the first time I had tried a group workshop, comprising two students who I was supervising (their final year dissertation projects were digital editions) and two students whose projects concerned print editing (from a module on Early Modern book history run by Prof. Ian Gadd). The knowledge base of these students was very varied: some had no experience of coding or markup; at the other end of the spectrum one was already competent with HTML. What, then, was the best way into encoding given this varied cohort? My answer was to start with the skills they already had (as @TEIConsortium emphasised), and emphasise the continuum between digital encoding and the traditional literary-critical analysis students use when preparing any text. After all, we’re so frequently concerned about the relationship between form and meaning. And it is the particular capability of XML/TEI to render this relationship between form and meaning that distinguishes it from other kinds of electronic coding. So the first part of the workshop started with pencil-and-paper tasks. We first annotated a photocopy of a poem. Then I gave them a print out of the transcribed poem stripped of some of its features – title, line spaces, peculiar line breaks, italicisation. I then asked them to annotate, or markup, this version with a set of instructions to make it look like the ‘original’. The result was that the students not only marked up formal features, but clearly had a sense that these features also carried meaning. For example, I asked, “why was it important to render a line space?” I also pointed out that none of them had inserted the missing title in the plain text version, which raised some eyebrows: “Is it part of the text?” “Well, how do you define the text?”, I replied. These question were important for several reasons. I wanted to make the point that markup was a set of editorial and interpretative decisions about what the ‘text’ was and how it might be rendered and for what purpose. I also wanted to emphasis that both practices – whether pencil notes in the margin or encoding on a screen – involved very similar processes. I next wanted to translate these points into an electronic context, by illustrating the differences between HTML as, essentially, a markup for how a text looks, to XML as a markup for describing that text. I did this by using my WordPress editor: by inserting a few HTML tags in the text editor mode then switching to the ‘visual’ mode they could see these features reproduced. At this point we moved to the computers and got down to some encoding in an XML editor (Oxygen). My main aim here was to enable them to markup the same poem in an XML editor to see how easily their literary-critical procedure could be transferred to this medium. In this, I was very gratified: all the students were able to create an XML file and mark up the poem remarkably easily. I spent the last section of the workshop answering the implicit question: “you can’t read XML, so what is this for?” Given the restrictions on time, I had to briefly engage with some very broad issues of digitization and preservation and of analysing big data. Putting it simply, I remarked “computers are stupid,” (my mantra), “but if we markup up our texts cleverly, we can get computers to look at large bodies of knowledge with precision.” Demonstrating this was tricky given the time restrictions, but I had a go by exemplifying the more complex encoding of meaning possible in XML/TEI. 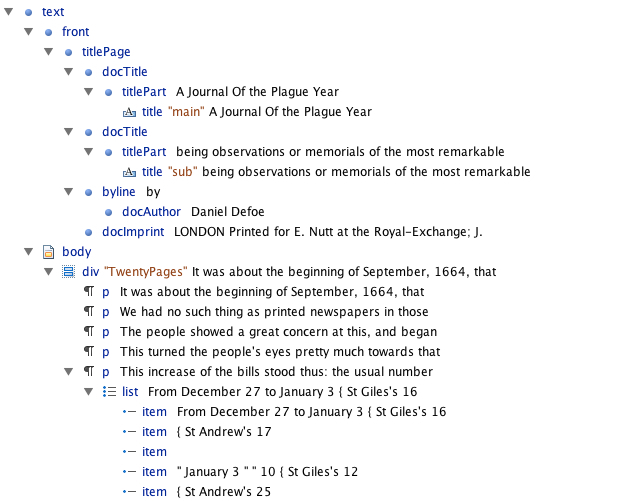 I used a former student’s markup of Defoe’s Hymn to the Pillory and an XML file of A Journal of a Plague Year. The former demonstrated the encoding of names; for example I asked “how would a computer know that ‘S—ll’ is Dr Henry Sacheverell unless you have a way of encoding that?” The Journal was useful for demonstrating the highly structured nature of TEI and the ability of us to markup structural features of texts in precise ways: features that a computer can then process. I also demonstrated the flexibility of TEI: by inserting a new < after a </> XML automatically shows a dropdown list of possible markup elements and attributes. But my key point was that deciding which features to encode – out of all the possible features of a text – was an interpretative and editorial decision. My aim for the workshop was modest: to enable students to make the leap from so-called ‘traditional’ literary-critical skills to the basics of encoding in XML, and in this I think the session was successful. On reflection, I think there two points which I hadn’t judged quite right. I hadn’t anticipated how quickly they could mark up a poem in XML; I think that was because the transition from pencil annotations to coding on screen worked very well. The last section – on the bigger point of getting computers to read literary texts – turned out to be more important than I had presumed and I would do this differently if I were to run this again. This might involve a follow-up session that, given the success of the first part of the session which involved hand-on tasks, would ask students to markup some more complex textual issues with TEI. This could be combined with a demo that not only showed some well-encoded texts but also the results of some data-mining of a medium-sized XML/TEI corpus. There are probably better ways to demonstrate this, given the limitations of the WP text editor, but it was very much to hand. I acknowledge here my use of teaching materials from the Digital Humanities Oxford Summer School (the very same ones from which I had learnt TEI).